Posted by astridjohnson in Graphic Design, Mental Health, Portfolio. An art project showcased in a brochure. Alan Shepley is an artist. 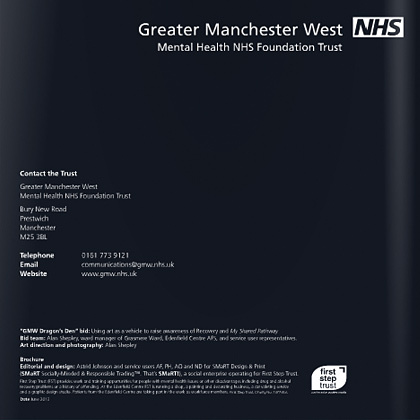 He is also the ward manager at one of the acute wards in the medium secure unit of Prestwich Hospital, one of the largest mental health hospitals in the North West. Alan has been working there since 1985, starting as a domestic assistant and his rich experience of working with mental health patients has a large influence on his radical, social and political stencil art. I love his work, check it out on Alan’s flickr account. 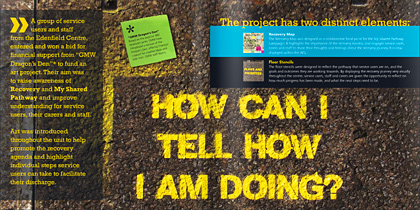 In 2013 Alan got a grant from Greater Manchester West NHS Mental Health Foundation Trust to do two art projects. 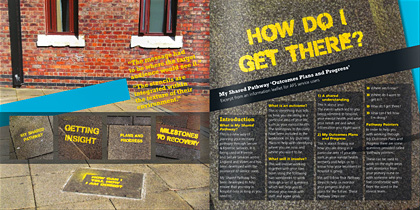 Alan asked me and my team of patient workforce to create a brochure to showcase both projects. The art project and the creation of the brochure was hugely supported by the management team of the Adult Forensic Services Directorate. This was a perfect design project as we had a free run on the design and editorial of the brochure and it gave my workforce the opportunity to learn some new artworking skills. 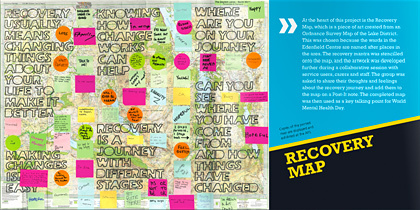 One of the two art projects was the “Recovery Map”, a piece of art created from an Ordnance Survey Map of the Lake District. This was chosen because the wards in the medium secure unit are named after places in the area. 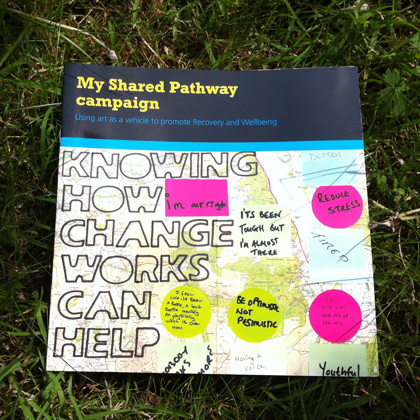 The recovery mantra was stencilled onto the map. 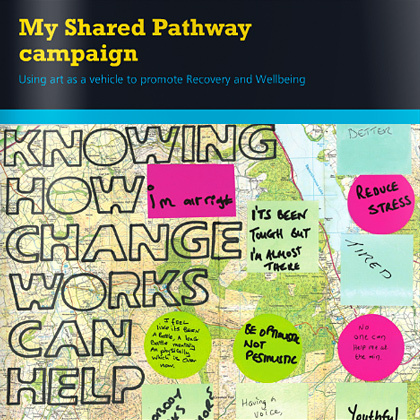 Service users, carers and staff were asked to share their thoughts and feelings about the recovery journey and add them to the map on a Post-It note. One of my workforce patiently scanned in the map in sections and learned how to patch them together in Photoshop. He also learned how to highlight the colour of all the Post-It notes and the type on them. 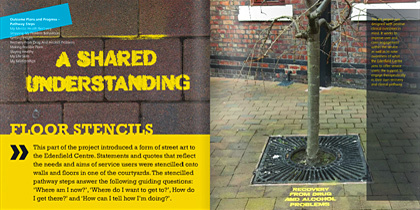 The second project was to introduce a form of street art to the medium secure unit. 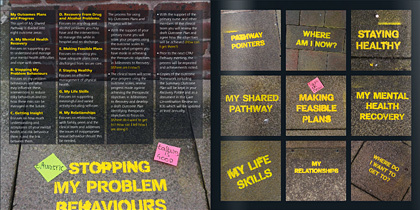 Statements and quotes that reflect the needs and aims of service users were stencilled onto walls and floors in one of the courtyards. Another of my workforce learned how to select the yellow type on the images and colour correct them, so they all looked a brighter and a similar yellow. 3 A friends cooking blog | Visit Arianha’s world and kitchen! 7 Revolt | UK Uncut – If they won’t chase them, we will. Enter your email address in case you find this stuff riveting enough to want to know immediately when something new turns up.